While the original Dark Knight Returns was the story of Batman and Superman, Dark Knight Strikes Again was about the Justice League - Flash and Atom were there, obviously, but also Hawkman/Hawkwoman, Shazam, Green Lantern, Martian Manhunter, Plastic Man for some stupid reason, and of course, Wonder Woman. 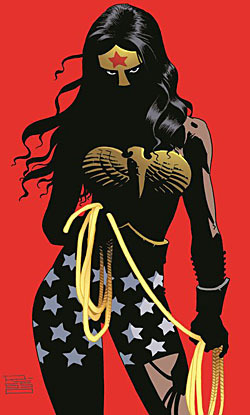 Frank Miller has a reputation for writing Wonder Woman poorly - and considering he's the writer who had her call a man "sperm bank," it's not entirely undeserved (but hey, at least he never gave an interview where he said she's not a feminist, right?). 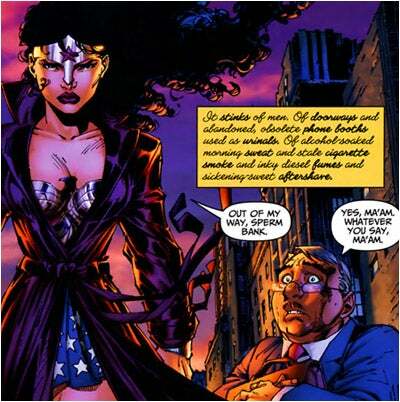 While DKR was definitely groundbreaking in regard to the relationship betwen Batman and Superman - making them begrudging allies at best - DK2 was much less innovative in the relationship between Supes and WW, simply following in Kingdom Come's footsteps (among others) by making them lovers. He could have gotten the jump on JLU by setting her up with Batman - or really confused things by having Batman and Superman be the couple. This figure was first "announced" when it showed up on the back of the Walgreens-exclusive Flash packaging, with no indication of where or when it would be sold. Well, the "when" turned out to be now and the "where" turned out to be at least two places - you can get her on Amazon (fittingly enough), but I found her at Toys Я Us. Will the figure turn up anywhere else, or is she a shared exclusive a la Menalippe? All I know is my gut says "maybe." Wonder Woman is 100% new sculpt, meaning she's perfectly in-scale with the other oversized figures. Remember nine years ago when Mattel released that Big Barda who wasn't very big? They need to try again, using this mold as a base. She stands almost 6⅞" tall, and is wearing the costume Miller designed for her. 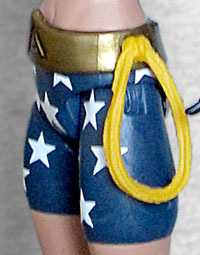 It's basically her vintage one, just without the red portion: her breastplate is an eagle, instead of two W's, and it's simply strapped to her chest, instead of being part of a cloth top; her belt is flat on the bottom but has a point on top, and her star-spangled blue trunks are skin-tight shorts. Instead of boots, she wears sandals, with straps that run all the way up to mid-shin. Her hands are black (we know they're hands and not gloves, because they have sculpted fingernails), and straps matching the sandals cover her forearms. She's got her bracelets, but they're short and golden, not long and silver. The face is wider and thicker than most Wonder Women - Diana usually adheres to white western beauty standards, but this one eschews that for a more diverse appearance. The thick lips are all Miller's design, but her drew her with a very narrow, angular face, not the strong, round one this toy gets. Her tiara now includes a nose guard, adding to the Grecian feel. The paint on all those thin laces is applied well, but the overall design could really use some red to help it pass the squint test - yes, she has a red star onher forehead, but that's it. Maybe if her sandals had been red? Something. The stylized A logo on her belt is sculpted in, but the paint doesn't line up correctly there; there were two of her at the store, and they both had the same issue. The big white stars on her bike shorts are tampoed on, but the way the masks line up ends up leaving a noticeable blank stripe down the outside of her left leg, under the lasso. 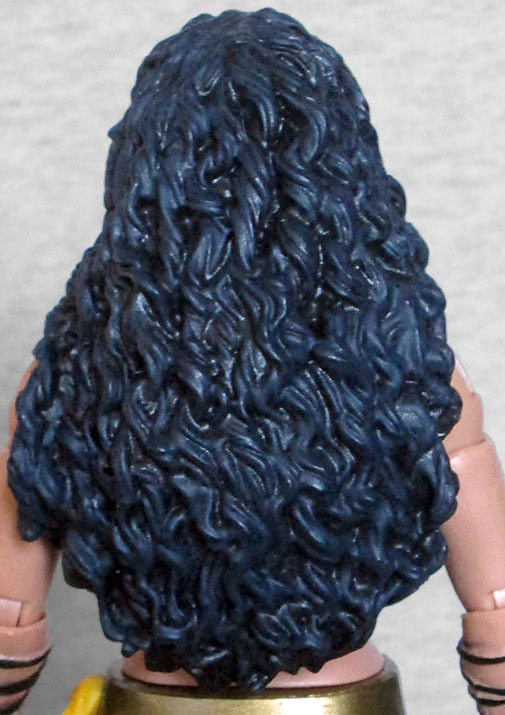 Her hair, which has an amazingly detailed sculpt that is thick and curly and looks completely appropriate for a Hellenic character, gets a lighter drybrushing to keep it from looking flat black. Her articulation isn't quite as good as the boys', lacking any kind of torso joint. There are hinged ankles and knees, swivel thighs, H-hips, a swivel waist, a balljointed head that's pretty much limited by her hair, swivel/hinge shoulders, swivel biceps, hinged elbows, and then duplicate swivels in the forearms and wrists. The crotch is wider than you'd expect, which makes her look like she's trying to air out or something. Still, you can definitely get her into some decent fighting poses. 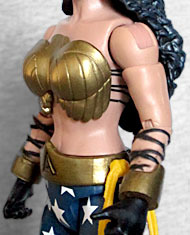 Wonder Woman's only accessory is a small dagger. It isn't anything from the story (as a cursory re-reading tells us), so presumably it's just something the Four Horsemen made up. Of course, the artwork on the front and side of the packaging isn't actually from DK2, but from Eduardo Risso's cover for the DKIII Wonder Woman mini-comic, so maybe it's something from there. [It's not --ed.] Either way, it has a silver blade and a golden hilt with a red gem on it, and can be held in either hand. She also comes with half of this series' Build-A-Figure, Dr. Psycho. 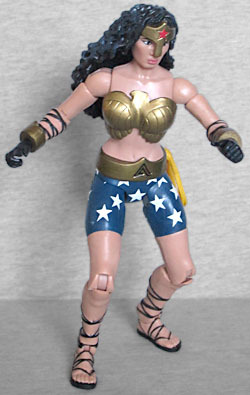 Yes, half: there are only two figures in this series - her and Wonder Girl - and Diana's got the torso and arms. Being written by Frank Miller, Dark Knight Strikes Again's Wonder Woman was kind of a wasted character - "Superman's broodmare" isn't a great role, you know? This toy, frankly, is a better representation of her than the comics delivered. She looks big and strong and powerful, and is shaped like a human being instead of whatever godawful mess Frank was drawing. She's recognizable as an Elseworlds version of Wonder Woman, but the design could easily be another Amazon just hanging out on Themyscria if that's how you want to set up your display.